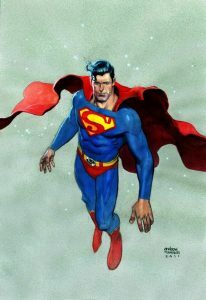 April 18th will be a momentous day in comic book history as ACTION COMICS #1000 drops on shelves! There are many variants representing the many eras of SUPERMAN as well as blank covers that you can purchase to get some of your favorite artists to put their rendition on! From 5 to 8 p.m., we'll have three fantastic artists in the house taking commissions to draw the Man of Steel on your blanks, ANDREW ROBINSON, SCOTT KOBLISH and RAFAEL NAVARRO will all be here creating dazzling covers right before your eyes! In addition, some of our very own Sketchy Bugs will be taking turns at drawing the Last Son of Krypton! A portion of the day's proceeds will go to benefit The Hero Initiative, our favorite non-profit organization that creates a financial safety net for comic creators who may need emergency medical aid, financial support for essentials of life, and an avenue back into paying work. So, put on your cape and tights and swoop on down to The Comic Bug to score some amazing original art! !